At #2 on Billboard’s Hot 100 this week is Bruno Mars with ‘That’s What I Like,’ the second single from 24K Magic. I like this song better than the album’s title track, which aimed for ‘Uptown Funk’ status but fell short. This one is sweeter and catchier. It has a hell of a cool video, too. Rounding out Billboard’s top five are two more blog repeats — twenty one pilots with ‘Heathens’ and DJ Snake feat. Justin Bieber with ‘Let Me Love You.’ It’s been two months since I last did a Billboard countdown and yet half the top ten is intact. I guess you don’t see a lot of chart movement in the fall. At #6 is Bruno Mars with ’24K Magic,’ his claim to retake the pop music throne after the runaway success of ‘Uptown Funk.’ And given that that track was actually a Mark Ronson tune, it’s actually been four years and two Super Bowl performances since Mars released his last album. Two and a half months into 2015, I’m kicking off my first installment of ‘What are the Kids Listening To?,’ wherein I feature ten songs ranking high on Billboard’s Hot 100. A glance at the chart reveals that the music business is a lot like the movie business, in that the first quarter of the year is sloooow. Most of the songs atop the Hot 100 are from 2014. With just 16 days left in 2014, it’s time for me shift into year-end mode. So here’s how the next few weeks on the blog will go. This week and next I’ll feature my final look at the Billboard charts for 2014. The week of New Year’s Eve, my family and I will be out of town so I’ll put the blog in vacation mode (with some nice tracks to fill the time, I hope). Then I’ll come back in the first week of 2015 and count down my top 20 songs of the year. This is another one that came up in my comments to your list regarding what I thought were some conspicuous omissions. Like you, I am not a huge fan of Mars, and I have never bought one of his albums. However, his talent is really quite undeniable, even if I don’t always love his style. Last July I spent two weeks on summer singles — those songs that dominate the airwaves during these carefree months. Songs that mostly check their brains at the door and ask nothing of the listener but to hum or dance along. I’ve traditionally been way behind in discovering summer singles, often not hearing them until months later. I’m the guy who didn’t hear ‘Umbrella’ or ‘I’ve Got a Feeling’ until they’d been in rotation for more than a year. Last summer I proactively remedied that situation, and this summer I’ve aiming to do so again. Moving into another week of summer singles, I find myself wondering why almost all of these songs “feature” somebody other than the lead artist. 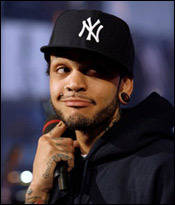 I suppose that’s standard procedure in hip-hop, the equivalent of a special guest star on a TV show during sweeps week. At times the collaborations are compelling (see Rihanna and Lil Wayne’s contributions to Eminem’s Recovery) but I usually find it gimmicky. 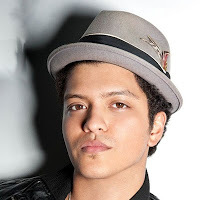 Bruno Mars shows up as a guest singer on a few of the tracks I came across when picking songs for the blog. I don’t know if he’s released any albums on his own of if he’s professional accompaniment. Something about the guy makes me want to smack him but he has a nice voice.